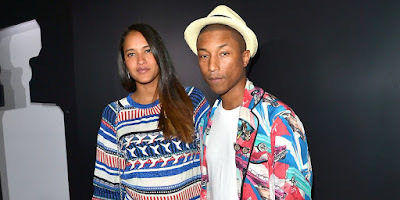 BHR Hollywood Reports.............Big Congrats are in order for Pharrell and his wife Helen Lasichanh, who reportedly welcomed triplets this month! Pharrell Williams and wife Helen Lasichanh are celebrating some happy news. The pair has welcomed three new bundles of joy, according to a representative for Williams. Williams and Lasichanh, who have been married since 2013, already have a son, Rocket. "Pharrell, Helen and Rocket Williams have welcomed triplets," Williams' rep tells reports. "The family is happy and healthy!" The babies' names have not been announced. Williams, a former "Voice" coach, is currently on the publicity trail promoting his work on the soundtrack for Oscar nominee "Hidden Figures." Along with the new additions to his family, Pharrell has even more reasons to celebrate. Hidden Figures, the film he co-produced, won best ensemble at this weekend’s SAG Awards, and is up for Best Picture at next month’s Oscars.